This trilogy of sixth-century plays by Aeschylus — Agamemnon, The Libation Bearers, and The Eumenides — traces part of a longer, grimmer family history. These three plays, at first glance, are about the murder of Agamemnon by his wife Clytaemnestra, and then their son Orestes’ revenge of his father. But the story is laced with references that go back generations. This is the house of Atreus, Orestes’ grandfather, “the embodiment of savagery,” as Robert Fagles says. Atreus’s brother Thyestes seduced Atreus’s wife, and Atreus feasted him on his own children’s flesh, calling down Thyestes’ curse. Atreus’s son Agamemnon sacrificed his daughter Iphigenia in order to coax good winds toward the battlefields of Troy — and we all know how that turned out. These plays boil with blood, with doom and foreknowledge and revenge, but they are also full of an incredible transformative power. They tell the story of a people just beginning to emerge from blood feud into a more orderly system of justice through democracy and courts, even when the need for vengeance cries out from the ground. We watch as the Furies change from terrifying demons into the blessing angels of Athens. This groundswell, this sea-change is eerily beautiful. Jenny: I have read almost no Greek literature (except French versions), not even basics like the Iliad and the Odyssey, so reading these plays made me feel like I’d walked into the middle of the world’s most violent soap opera. Who are these people? Why are they all so upset with each other? Her father is who, again? She’s sleeping with him? Hey! Watch that blade! But as I kept reading (and reading Robert Fagles’s superb notes), I began to settle into the rhythm of the work. Certain cultural values — loyalty, respect for the gods, hospitality — began to come to the forefront. While there are still things I’m not sure I’m clear about, and would probably have to study to understand — the use of the chorus, for instance — the whole shape of the plays became more, not less, clear and interesting as I read. Teresa: I’ve only read bits and pieces of The Odyssey as well as Oedipus and Antigone—and The Aeneid to cover the Roman side of the Trojan War—and I’ve seen a production of Ion by Euripides, but this particular corner of Greek myth is not one I’ve explored before. So although I had a vague sense of some of the relationships coming in, I was fuzzy about the details. It didn’t take me long to get wrapped up in the passion and intensity of the work. To call it a soap opera is absolutely right! And one that seems to have no possible happy ending. What struck me most of all, especially in Agamemnon and The Libation Bearers, was the futility of this cycle the characters were caught in. Murder, revenge, revenge against the avenger, and on and on. And this is called for by the Gods! It’s a hopeless situation, and Clytaemnestra, Orestes, and all the others are just caught up in it. Jenny: That sense of destiny and inescapable fate makes the plays so intense. Cassandra stands out for me as a symbol of that fate: she sees Agamemnon’s murder, and her own, but even when she prophesies it (and even though, in this last case, she is believed!) she can’t do anything about it. A life for a life for a life. Everything seems to be behind it: the people, the religious rites, the gods, the soldiers, the natural world. I was interested to see that men and women were equally caught in those nets. Even though Electra doesn’t perform the murder herself, she’s right there with Orestes, urging it, and the roles of Iphigenia and Helen are just as important in triggering war, sacrifice, and fury. One of the things that caught my attention most in these plays was the sense of personality I got from the characters. With pieces this old, I can sometimes expect to see “types” — the hero, the avenger, the murderess, the seer. Instead, even the chorus had its opinion, and wasn’t afraid to speak up. I got a strong sense of who Clytaemnestra was and how she felt about her husband (hint: not good.) Electra’s reluctance to believe that Orestes could really have returned from exile tugged at my heart. Teresa: I was really fascinated in the role of the chorus here. My (extremely vague) memory of the other Greek plays I’ve read is that the chorus generally provides commentary, sometimes “speaking truth to power,” but not actually acting. Here, the chorus doesn’t just speak up; it gets involved. By The Eumenides, the chorus has become the Furies, and they put Orestes, and by extension Apollo, on trial! But that trial left me terribly conflicted. I wanted something to happen to make the cycle of violence to end, and at heart I fully support Athena’s command to “worship the mean,” but she still takes sides, and when one side is characterized as representing womanhood and the other manhood, I can’t fully get behind it. Could she not have brought about the same result without choosing a side? Jenny: Oh, see, I saw this differently. I saw her as bringing the cycle of violence to an end by refusing to decide the issue herself, except as a tie-breaker. When she essentially creates the court of Athens, bringing in citizens to decide for or against Orestes, and forcing Apollo — a god! — to be a mere witness, in my view she is saying that no one from now on can simply take matters into his own hands. It reminded me vividly of a museum I visited in Germany once, the Criminal Museum in Rothenburg ob der Tauber. It contained all kinds of terrible instruments of torture — thumbscrews, cages, scold’s bridles. I had to remind my students that this was an advance, this was jurisprudence. This meant that one clan wouldn’t just sweep in and kill your whole family, obliging you to go kill their whole family, world without end, amen. My students took some convincing, and so did the Furies, but I think they came around in the end. In fact, I think it was that transformation of the Furies into the Eumenides that I found most moving. They are the embodiment of blood-revenge, of dysfunctional families, of violence being handed on, generation after generation. And even though their case against Orestes was watertight (I thought), they agreed to accept Athena’s vote and become blessing angels instead. Life instead of death, for everyone. Teresa: I absolutely agree that it was an advance—the outcome was definitely a positive one, and I like your point about Athena’s creation of the court and bringing the option to take matters in your own hands to and end. This is absolutely a good thing. But I wish that Athena herself had remained more stolidly neutral. The fact that she rendered her own opinion, and that she does so before the jury even decides, makes Orestes’s masculine side seem just a little more correct in the world of the play. That’s what I regret about it. But the fact that resolution of these plays could elicit such differing reactions shows that the Greeks and their ideas still have resonance and richness for us today. Yet another reason to continue reading—and debating—the classics! This post is our contribution to the Ancient Greeks Tour for the Classics Circuit, which is running from January 26 to February 4. For links to more posts on Greek literature, check out the tour schedule. This entry was posted in Classics, Drama, Fiction. Bookmark the permalink. Lovely post. One of the things that often strikes me in classical Greek literature is the way that the Gods get involved in everyday human affairs and often fight their own battles through their human proxies or even treat human affairs as a game. It’s a very different concept of divinity to most modern concepts. You’re absolutely right, it is quite different. So interesting, especially the deciding role of Athena and Apollo here. I loved your discussion, you’ve certainly encouraged me to read this trilogy. Thanks. It was wonderful, and it really made me want to read more, myself! Other Jenny, thank you so much for the recommendation! I would love to read the Book of Greek Myths. On my list it goes. And I agree that Fagles can scarcely be beat. Well – sort of. You must read – after that line, I mean must – Iphigenia at Aulis and maybe Iphigenia in Tauris, plays by Euripides. Oh, man. You mean we don’t all know how that turned out? I was really just guessing, with all the sacrifice talk. Okay, already. I’m a-reading. The audience of Aeschylus certainly knew exactly how the story went. Which didn’t mean there wasn’t room for surprise – that’s Euripides. You can see in the Oresteia how everything is founded on Homer. The audience knew Homer inside out, and they knew other tradtions and stories, too. Every little tweak and variation is meaningful. Given what has been lost, I doubt classicists could identify them all. That’s my problem, exactly: I don’t know how the story goes. I know bits and pieces of it, but Homer inside out I don’t know from, never mind what has been lost. I see what I’ll be doing this summer. Love this post! I read these three for a class in college, but would like to re-read on my own sometime. You’ve inspired me. I never had to read these for any classes, and I’m so glad I read them for the Classics Circuit. This group has been wonderful for my education. I agree with Katrina on this one…the back and forth discussion made this post especially enjoyable. All the more reason to encourage students to become Classics majors is what many of my Latin professors would say. Glad you like the discussion — Teresa and I love these conversation posts. And yes, the more Classics majors, the better! Part of why the trial by jury system is highlighted at the end of the trilogy is because these plays were originally performed at an important Greek festivals, a once a year event (the City Dionysia). Lots of visiting emissaries/ambassadors/what have you were visiting, and it was the Greeks chance to show how wonderful, how evolved, how judicious they were (Look we have trial by jury! No need to continue the barbaric cycle of revenge!). Most of the early tragedians’ goal was to show how wonderful Athens was, and later playwrights (like Euripedes) got themselves into trouble by poking fun at Athens. I meant to say Aristophanes instead of Euripides in that last bit about getting into trouble with the state. Sorry! Thank you for this! I especially appreciate the recommendation for Aristophanes, Anyone who pokes fun at the ruling trope, whatever that may be, is aces in my book. Wonderful post and conversation. I am more of your opinion Teresa when it comes to the Eumenides. I resented Athena taking sides and setting it up as masculine v feminine and in essence cutting women out of the newly established judicial system. At least with the Furies there was a chance for women to have a sort of justice even if it was brutal. But then I’m also sympathetic to Clytemnestra. But the Furies pursued men *and* women. Whoever killed someone of their own blood. And juries would essentially do the same — justice for men or women. This particular thing happened to be Orestes vs Clytaemnestra, but I don’t think it was essentially masculine vs feminine forever. Just my reading! I don’t think that Furies/Clytaemnestra were more innocent or pure than Orestes/Apollo. Both sides were tainted by the cycle of revenge, and it had to be stopped. And it was stopped, which is a good thing. But there was an awful lot of male vs. female language in the trial itself that I found hard to dismiss. Having Athena actually choose a side compounded that. Nice job on this you two! I just finished reading Gilgamesh, and it was the same thing. Gilgamesh himself is two-thirds god, one-third mortal (interesting biology, right?) So it does seem like a very intimate relationship, none of this notion that we’re on our own! Great discussion, and you are right, a soap-opera is exactly what most of the greek classics remind me of. I didn’t make that connection until you said it. I’m looking forward to reading the Orestia now (having finished Electra). I keep getting differing opinions on which translation to read though. Did you like Fagles? I really did like Fagles (Teresa, what did you think?) But Emily at Evening All Afternoon and Amateur Reader at Wuthering Expectations both strongly recommended Anne Carson’s more interpretive and poetic version, which very much appealed to me. I will probably read that at some point, because the poetic rendering of Gilgamesh that I read opened the work up to me in a way a more literal version might not have. 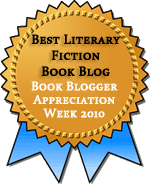 Fagles is outstanding – I just reread it. If the Penguin edition is the same, it comes with an introduction that is virtually a separate book. Good, good stuff. The Fagles / Penguin edition of Sophocles has an essay about the history and conventions of the Greek stage that I’d recommend to anyone vaguely interested. As good as Fagles is, though, there are now a lot of alternatives. Many good choices. Do not stress: just read one. I really liked the Fagles as well, and yes, as Amateur Reader says, the Penguin edition that’s pictured includes an introduction that’s probably a good half of the book. Lots of helpful information there (although I would have liked the intro. more in a separate edition so I could have the text in front of me as I read–he does basically a scene-by-scene analysis). And the Carson, which does sound amazing, is actually a combo of three different plays: Agammemnon, Electra by Sophocles, and Orestes by Euripedes. Thanks guys! Yes Ms. Carson has been mentioned to me as well, I may have to just sit in the bookstore for a while and see which one speaks to me! From what I’ve read (commentary, that is), the three big writers of tragedy–Sophocles, Euripides, and Aschylus–all treated the Chorus in very different ways. This sounds so interesting. I’ll have to find it as well. Sigh. so much to read! Oh, I know, tell me about it. I’m now making big plans for the summer, to read Homer. Can’t wait! Both of you really pegged this! 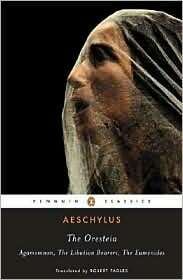 I first read Aeschylus’ “The Oresteia” in 2010, and went on a tear and read just about every translation of it that I could find. As much as I love the terrific work of Robert Fagles, I have to say that perhaps my favorite translation/adaptation is the one done by the late British Poet Laureate, Ted Hughes. It is truly amazing, and really brings the emotional power of the plays to the fore. I continue to be profoundly affected by the human journey from darkness, evil, and sheer horror to that of Light, Justice, and some notion of societal order and civilization as one reads the three plays. Brilliant stuff! Chris, thanks for the great comments, and the Hughes recommendation. I am thinking of reading Homer over the summer, and face a similar translation problem (well, not problem, but issue.) Thank you for your thoughts!